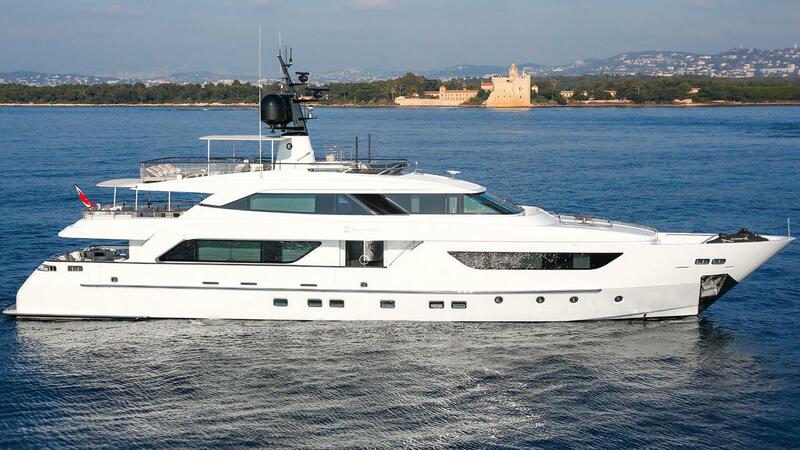 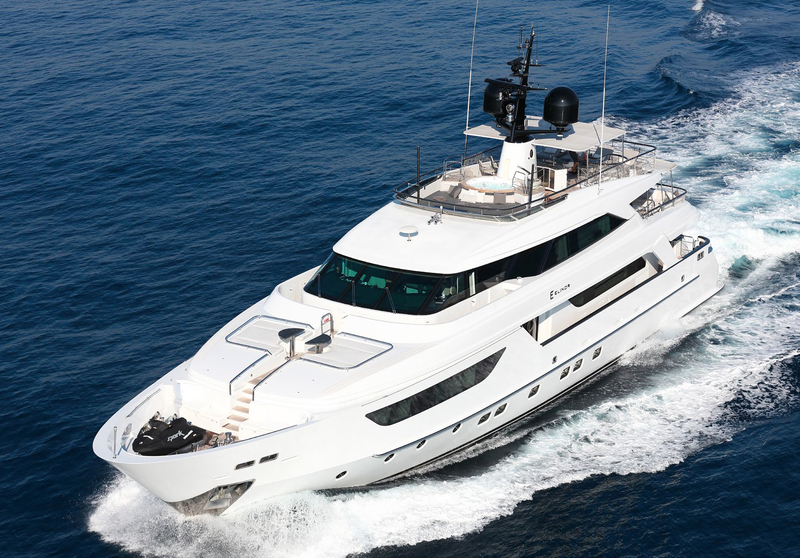 Built by Sanlorenzo in 2009 and last refitted in 2016, luxury yacht ELINOR was previously known as BIKINI QUEEN and features the exterior styling of Francesco Paszkowski. 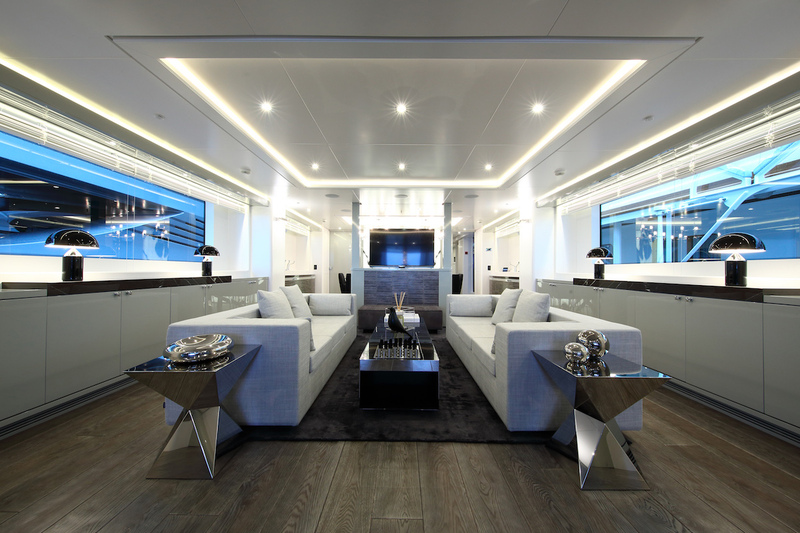 The beautiful interiors follow contemporary design trends to create stunning living spaces in white and dark grey. 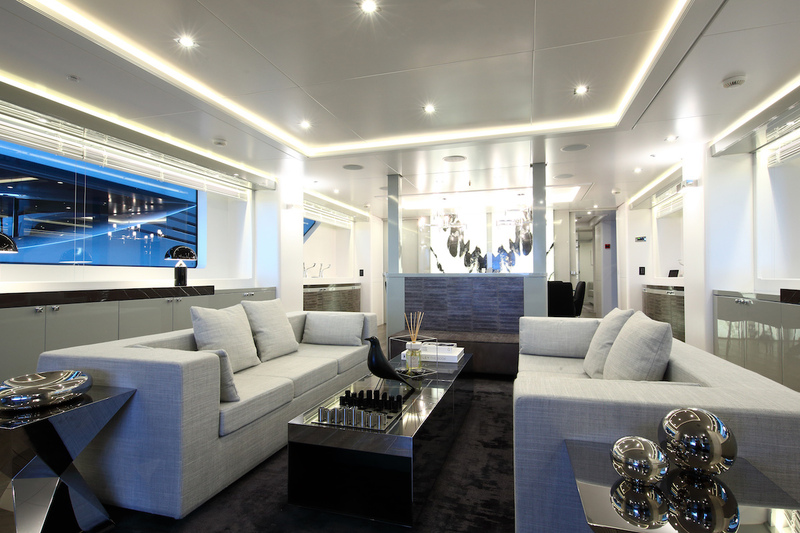 The main salon contains two plush sofas that face each other over a coffee table and farther forward the formal dining area seats up to 10 guests in a comfortable space with minimalist elegance. 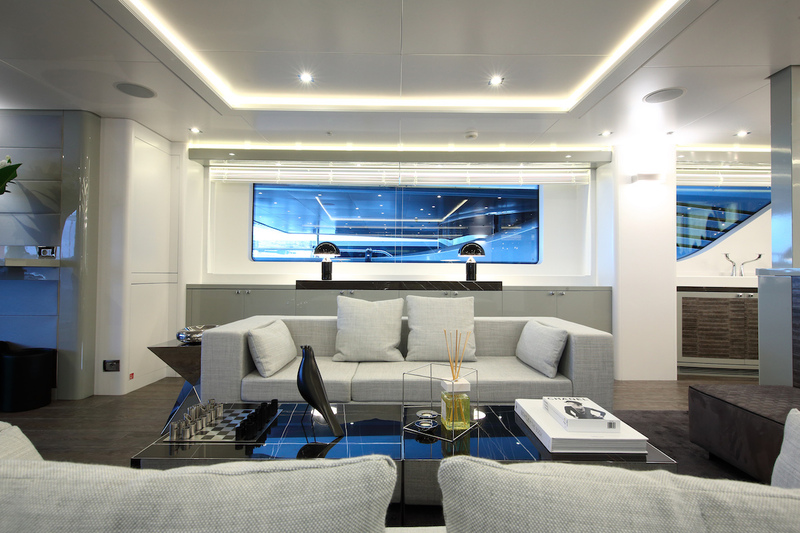 Gloss surfaces enhance the natural light in the main salon and in the evenings there are plenty artificial sources in the ceiling and from lamps to continue entertaining after sundown. 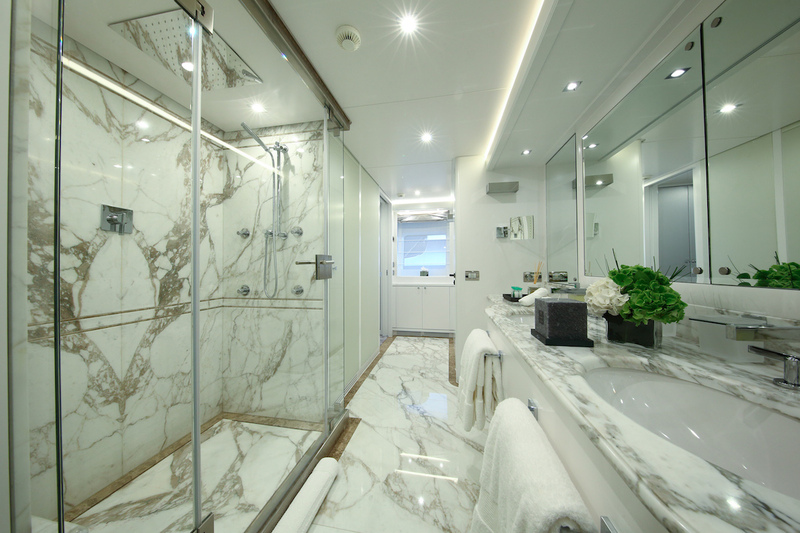 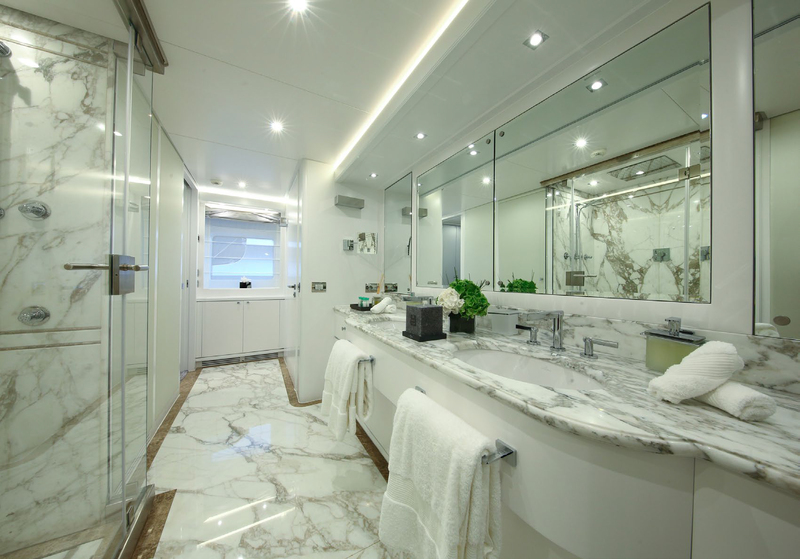 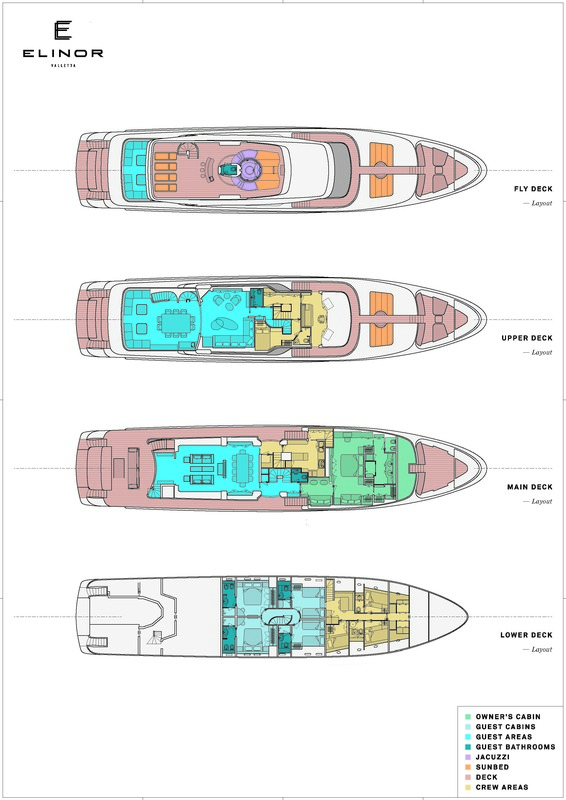 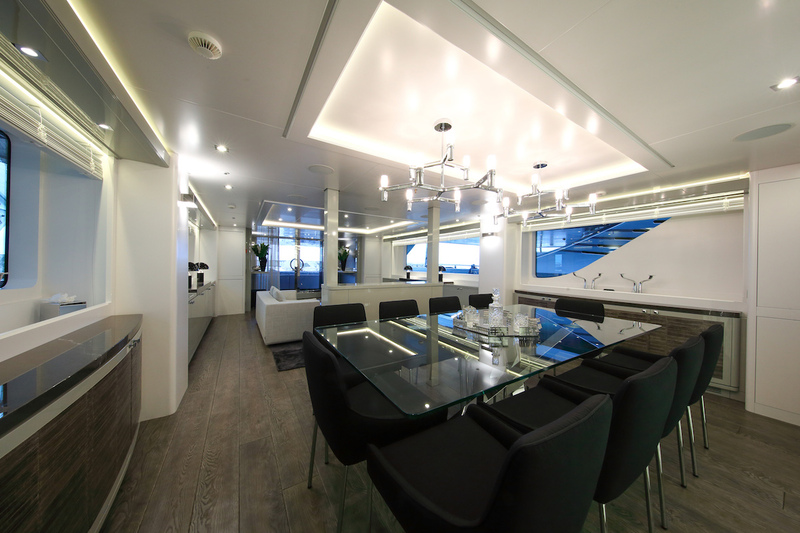 The main deck aft is unusual in offering a more relaxed alfresco saloon setting that faces out towards the aft, ensuring that guests never miss any of each destination's landmarks. 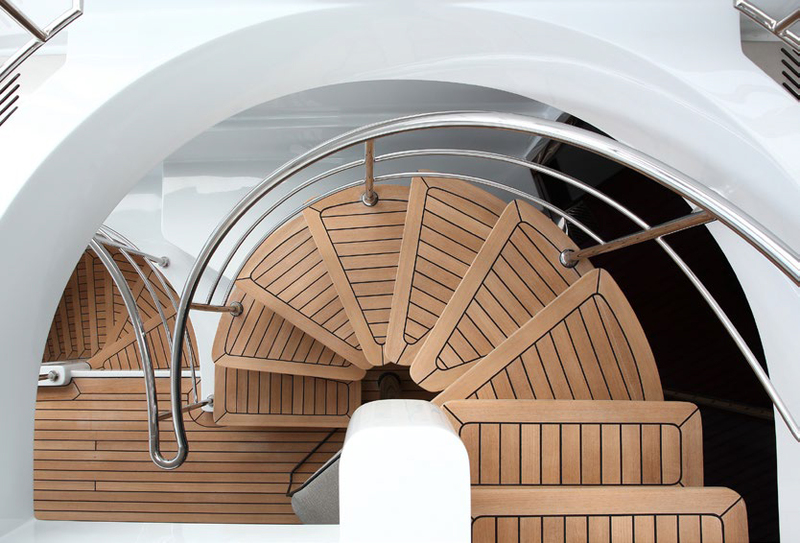 On each side of the stern there are two gated stairways that lead down to the swim platform and the tender garage. 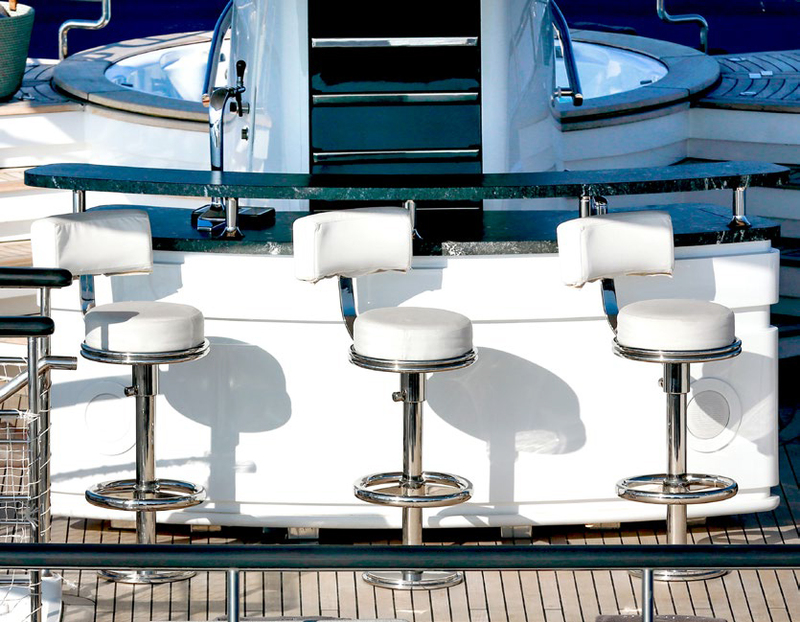 The skylounge offers a generous and more informal gathering space. 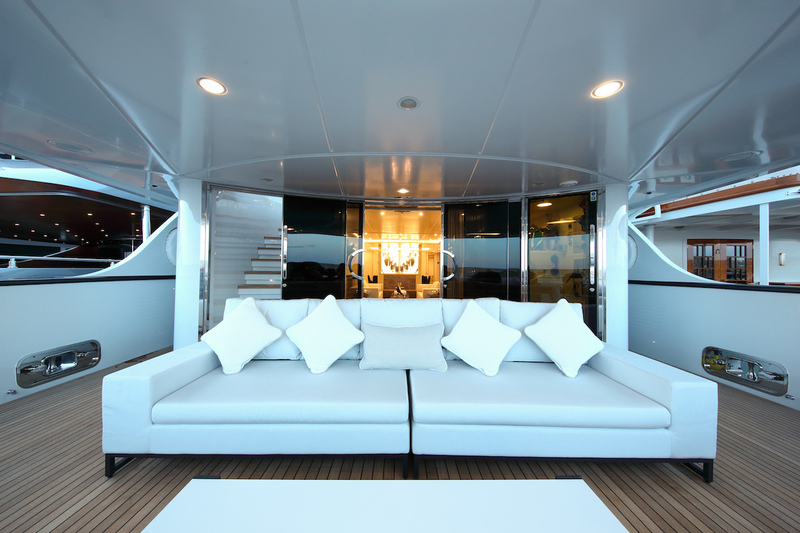 The large L-shaped sofa and coffee table is placed beside the long starboard window. 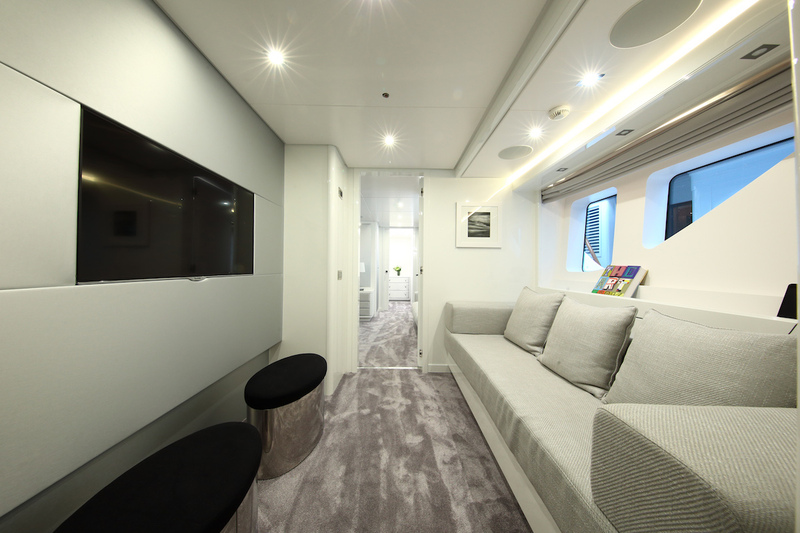 Two adjacent armchairs and a television balance the interior while leaving room for guests to move about and access the large sliding doors to the upper deck aft. 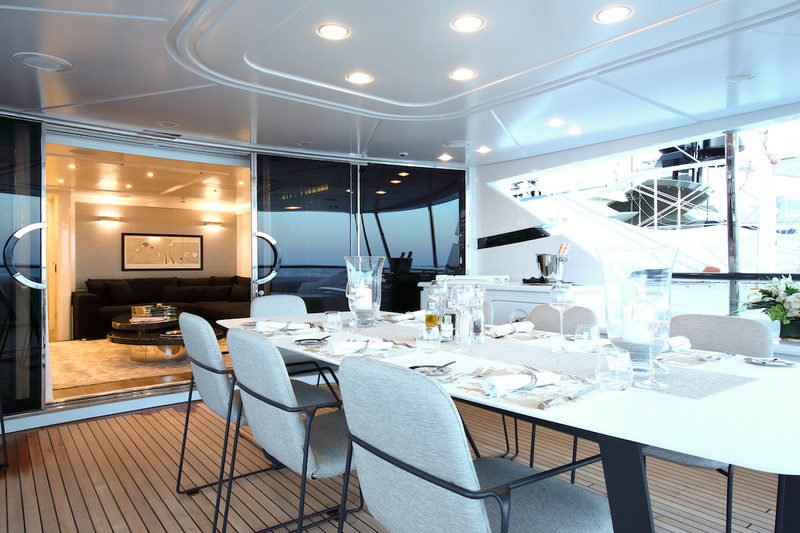 Dine alfresco in the shade on the upper deck aft, where the table seats up to eight guests and strong lighting in the sundeck overhang ensures that meals can take place late in the evening and at night. 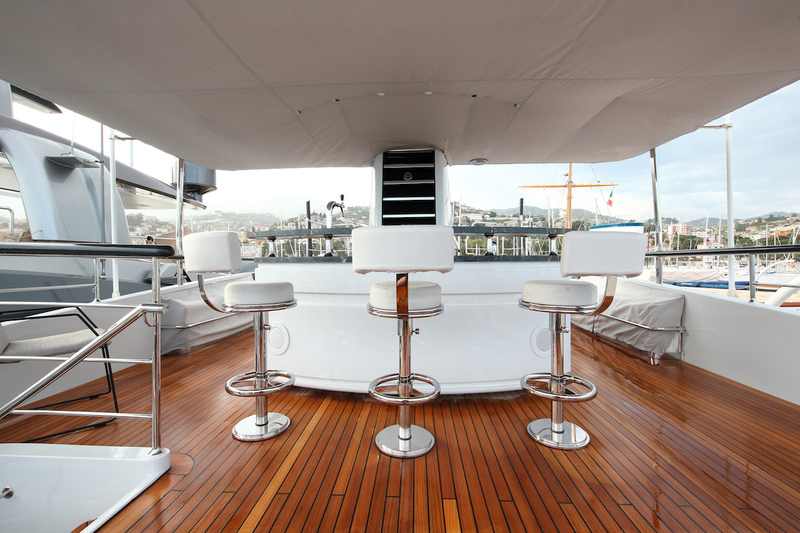 There is seating fitted along the stern capable of seating guests and additional visitors, creating an ideal area for social gatherings. 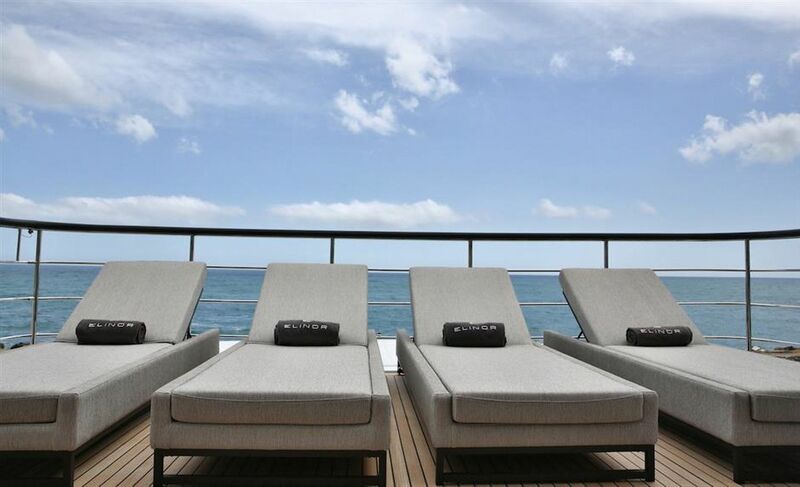 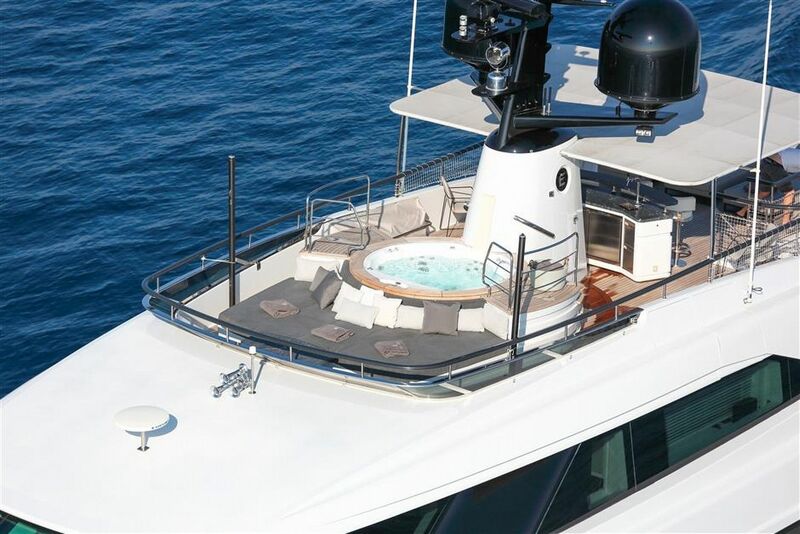 The sundeck continues the grey and white colour scheme and offers a large forward sunbathing area beside a circular Jacuzzi that guests can easily enter and leave via the steps at either side. 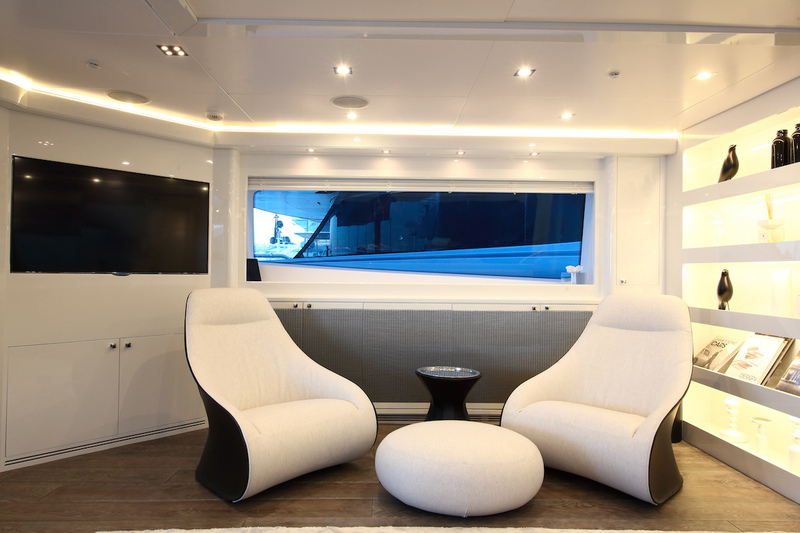 The shaded central section is fitted with a bar and casual seating for relaxing out of the sunshine. 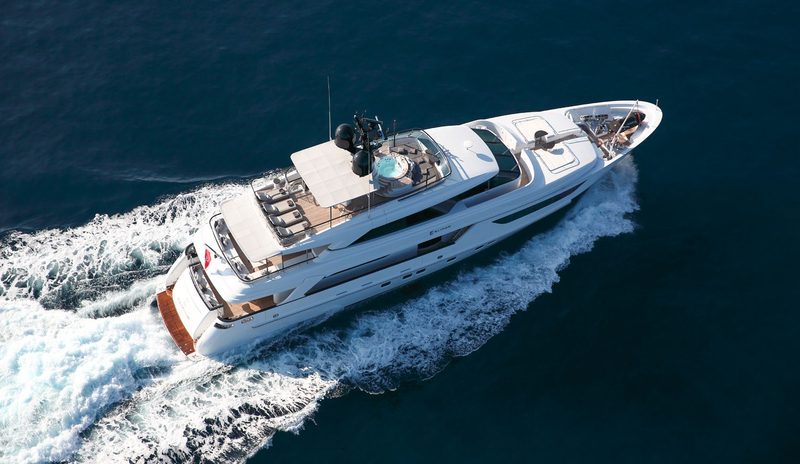 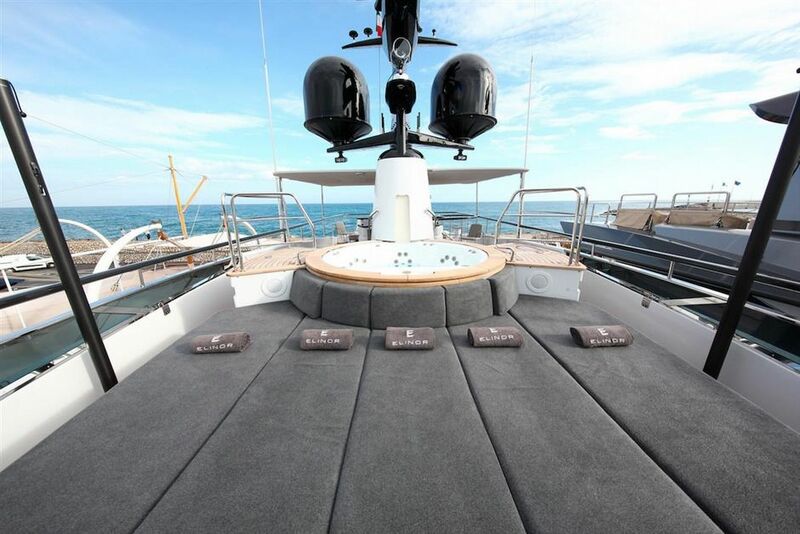 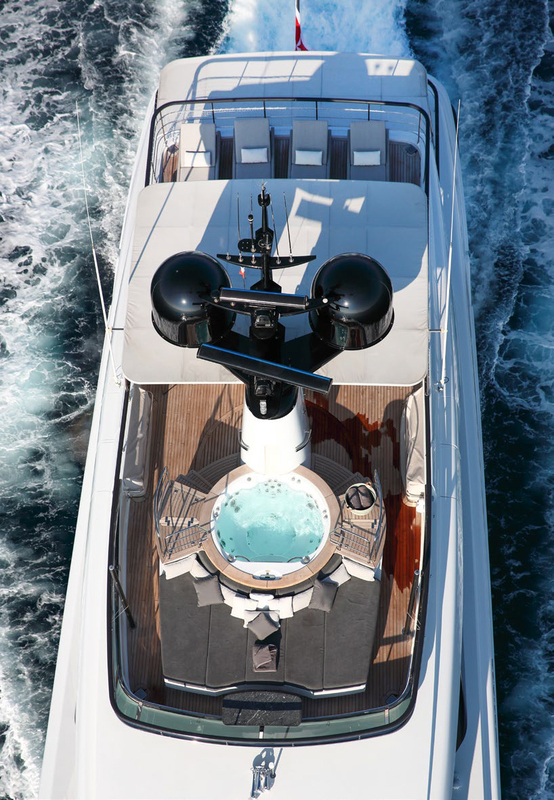 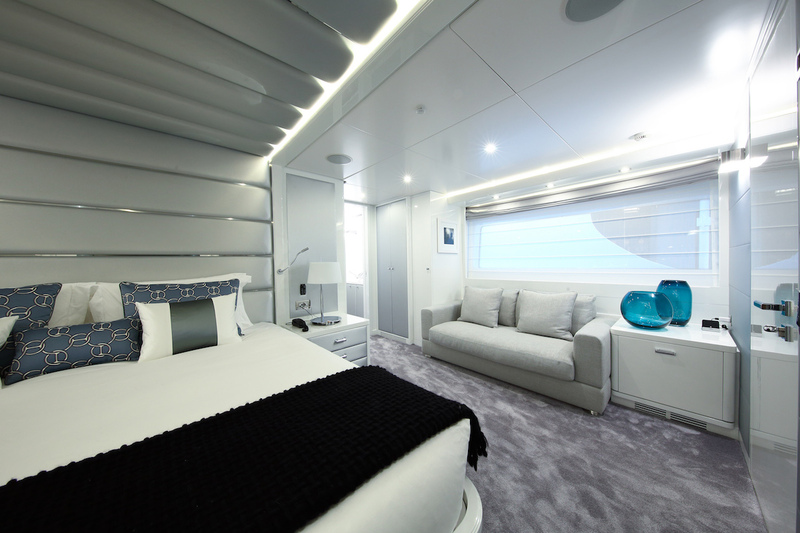 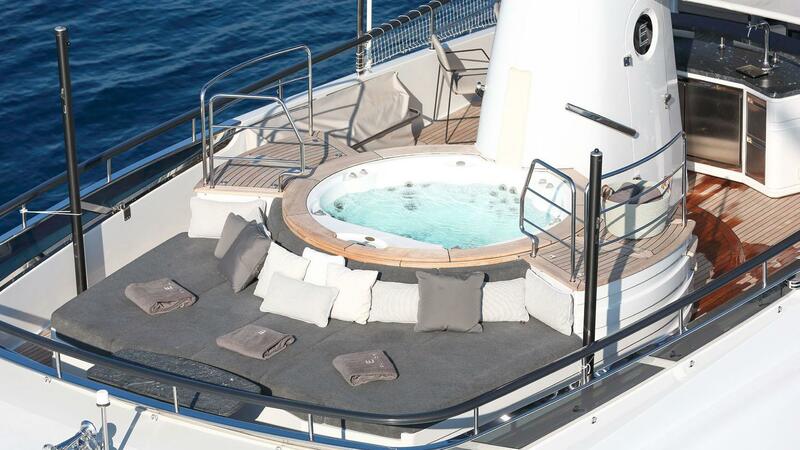 The aft section contains a selection of soft-padded sun loungers to complete the available sunbathing spaces on board. 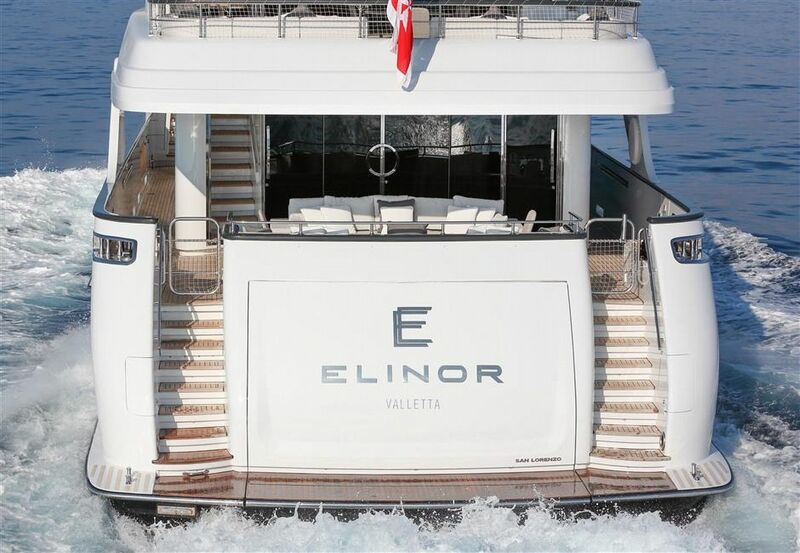 Superyacht ELINOR is an approved RYA Water Sports Centre so that guests can learn how to use the jet skis and leave with skills that last a lifetime. 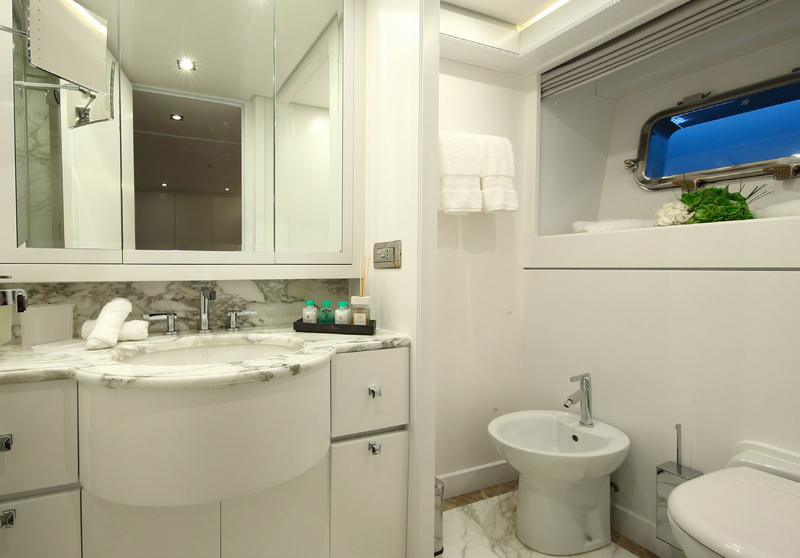 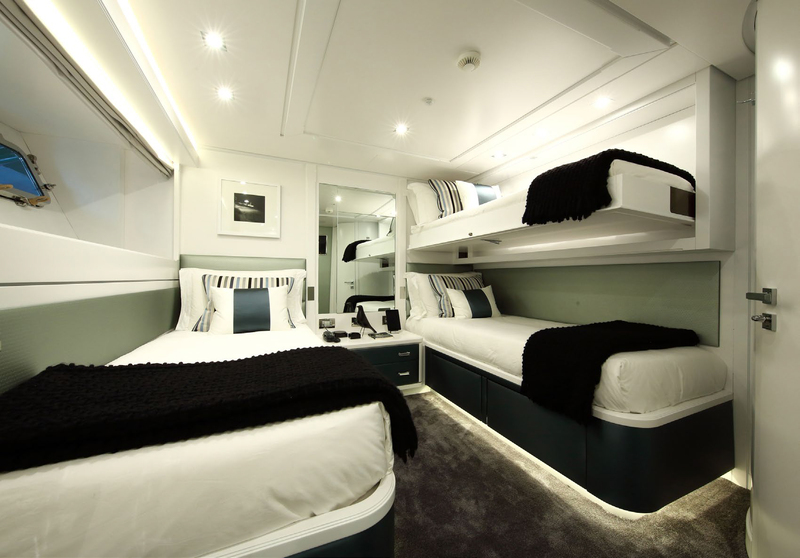 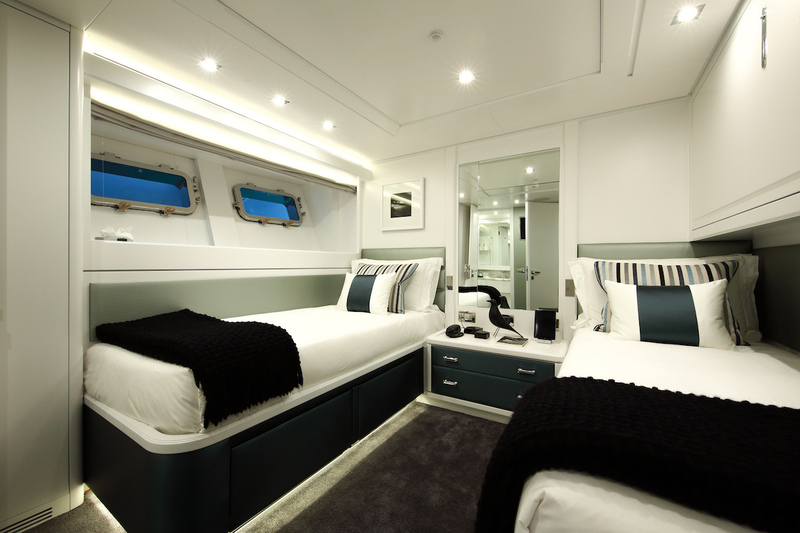 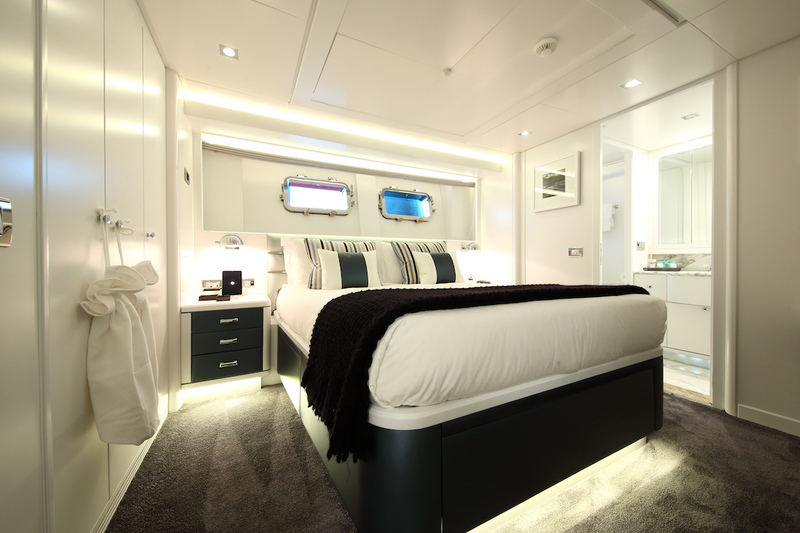 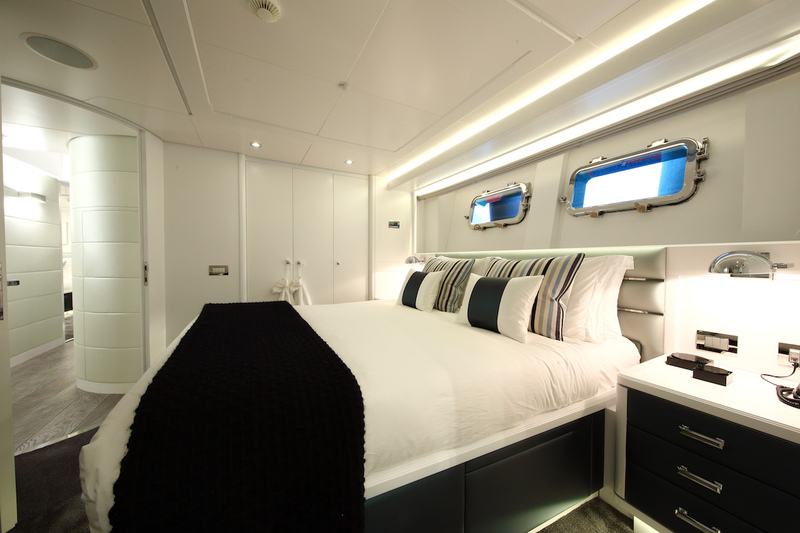 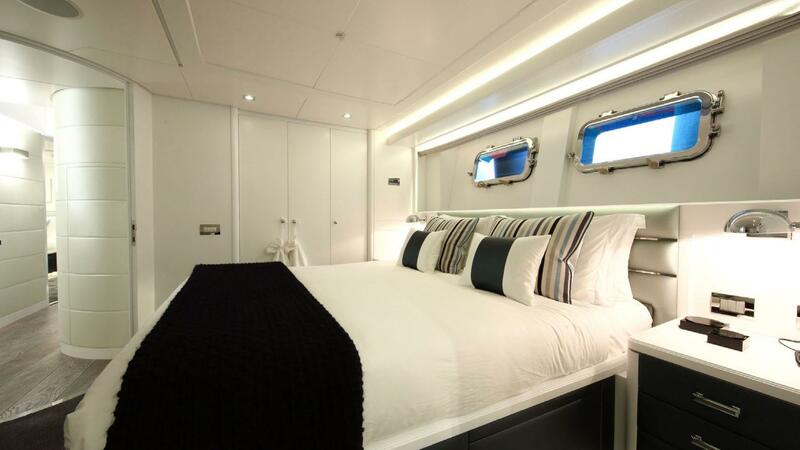 The accommodation is designed to sleep up to 12 guests across 5 cabins, which includes 1 Master suite, 2 VIP staterooms and 2 twin cabins. 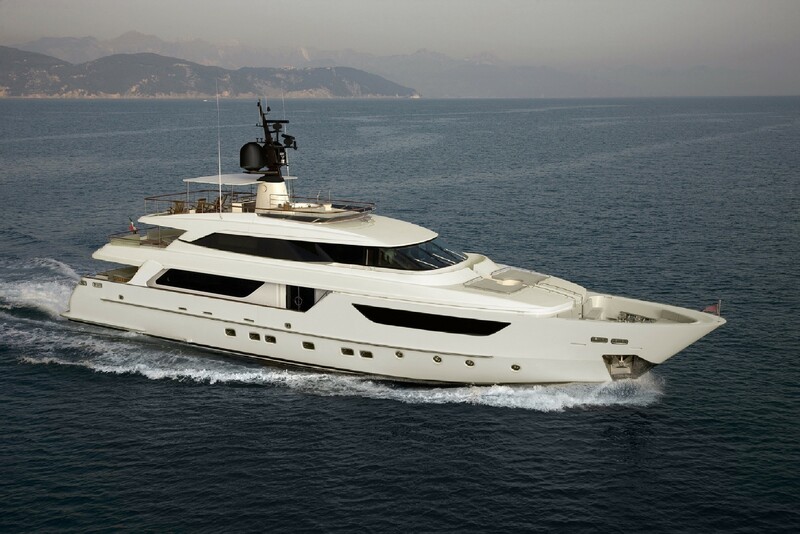 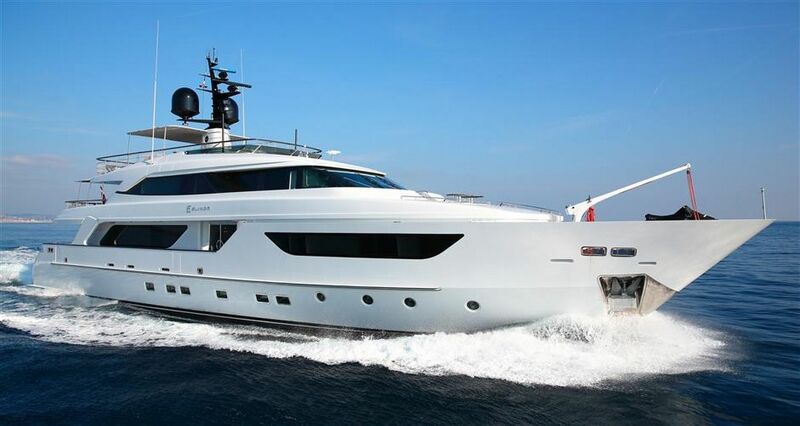 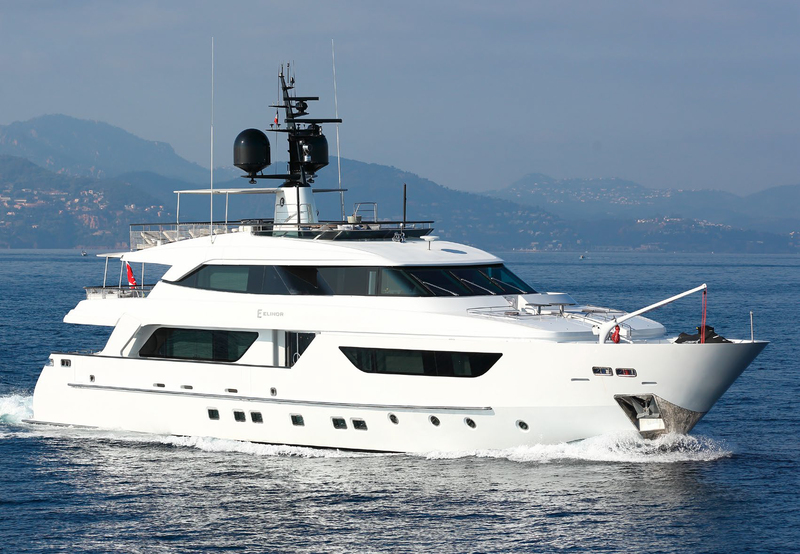 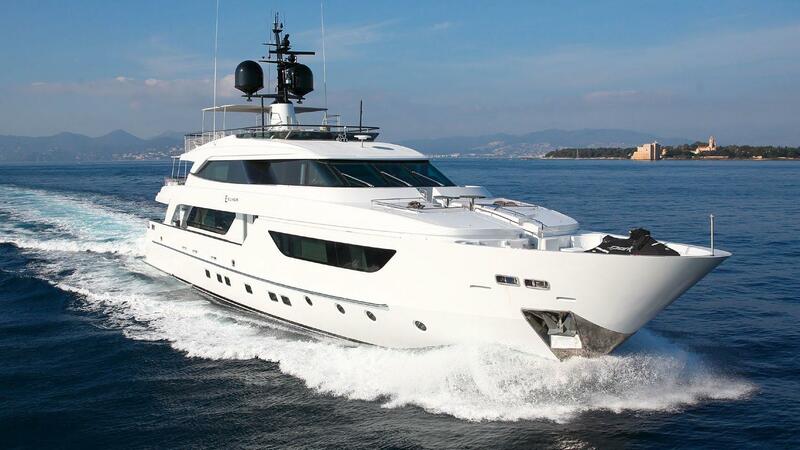 The crew of 7 will provide guests with excellent service throughout the charter.